Flood hazard is assessed for the data scarce lower Bharathapuzha basin in Kerala, India, using a hydrologic-hydraulic approach. L-moment-based regional flood frequency analysis along with a non-dimensional analysis of hydrographs is used to generate scenarios for flood hazard assessment. A fully hydrodynamic 1D river flow model is calibrated for the rivers of lower Bharathapuzha basin for the year 1992 and validated for the year 1994. The widely available SRTM DEM is used to extract river cross-sections and the limited available discharge and water level data are used to carefully calibrate the 1D river flow model. Subsequently, a coupled 1D-2D flood inundation model is used to simulate the flood inundation extent for the year 2002. In the absence of LIDAR data, a cartographic DEM derived from readily available topo maps is used as an input in the coupled 1D-2D model. Further, in the absence of microwave Synthetic Aperture Radar (SAR) data, the flood inundation extent is validated using the readily available optical IRS-1D WiFS sensor data which is mainly intended for vegetation and drought monitoring. A suitable methodology is used to delineate flood inundation extent from the partial cloud-covered WiFS image. The regional flood frequency estimates and the calibrated and validated flood inundation model are then used to assess the flood hazard. Chebana, F., & Ouarda, T. B. M. J. (2007). Multivariate L-moment homogeneity test. Water Resources Research, 43. https://doi.org/10.1029/2006WR005639. Cunderlik, J. M., & Burn, D. H. (2006). Switching the pooling similarity distances: Mahalanobis for Euclidean. Water Resources Research, 42. https://doi.org/10.1029/2005WR004245. FEMA. (2003). Federal Emergency Management Agency. http://www.fema.gov/nfip. Accessed 25 Mar 2019. 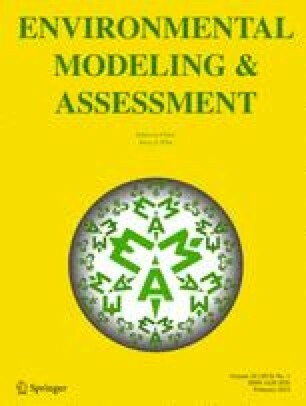 Hesselink, A. W., Stelling, G. S., Kwadijk, J. C. J., & Middelkoop, H. (2003). Inundation of a Dutch river polder, sensitivity analysis of a physically based inundation model using historic data. Water Resources Research, 39. https://doi.org/10.1029/2002WR001334. National Remote Sensing Agency. (2003). IRS-P6 data user’s handbook. Report No. IRS-P6/NRSA/NDC/HB-10/03, edition: Oct. 1, 2003, URL: http://www.euromap.de/download/P6_data_user_handbook.pdf. Accessed 25 Mar 2019. Vorogushyn, S., Merz, B., Lindenschmidt, K.-E., & Apel, H. (2010). A new methodology for flood hazard assessment considering dike breaches. Water Resources Research, 46. https://doi.org/10.1029/2009WR008475. Wilson, M., Bates, P., Alsdorf, D., Forsberg, B., Horritt, M., Melack, J., Frappart, F., & Famiglietti, J. (2007). Modeling large-scale inundation of Amazonian seasonally flooded wetlands. Geophysical Research Letters, 34. https://doi.org/10.1029/2007GL030156.